“Everyone is determined to continue on the success of last season and hopefully bring some trophies back to Ravenhill,” says the full back. Adam D'Arcy grew up in Manly, Sydney. FULL BACK ADAM D’ARCY will be providing a regular blog for Ulster Rugby this season and the province has kindly allowed TheScore.ie to reproduce the content from its website. The 26-year-old is preparing for his third season with Ulster and featured 26 times in Pro12 and Heineken Cup action in 2011/12. He faced stiff competition for the number 15 jersey from South African international Stefan Terblanche last season and will be looking to make the jersey his own during the upcoming campaigns. The Australian born player gives supporters an insight into pre-season training, switching back on and the prospects of lining out in the backline with returning Ulster hero Tommy Bowe. As the sun faded over the lighthouse atop the headland at Port De Soller, Majorca, Spain, my iPhone rudely and surprisingly came back to life for the first time in 4 weeks. You see in the weeks prior I had heard nothing from it, communication with the phone was a one way street of me taking photos of Palma Cathedral, recording videos of boat trips round Sydney harbour, and mostly, for my girlfriend to check us in on Facebook at every tapas bar, cafe, hotel, movie house and airport terminal that we set foot in. I didn’t like this interruption one bit. I looked over, adjusting my eyes to the glare of the piercing sun reflecting off the screen, and opened up an 11 line text from our strength and conditioning coach Johnny Davis. The first two words boldly stood out in capitals, and they were the only words that I read – PRE SEASON. An email from our fabulous team co-ordinator Sarah followed outlining week one’s training, and a notification reminding me that my skin fold test was next Friday. It all slowly began to sink in. I switched off my phone, shook the sand of my feet and started to pack, my holiday was over. I boarded the plane in Spain in a pair of shorts, t shirt and flip flops (I’ve learnt not to say thongs anymore as I’ve had a few uncomfortable experiences in the past here), and exited it in Belfast in a pair of Jeans, Jumper and shoes. Even though Belfast was living under a parked cloud that had no intention of moving, I was glad to be back. The taxi driver’s accent was familiar and there wasn’t half of Palma trying to sell me fake Ray Ban’s from the back of a moving fruit truck. I had one day to adjust back into Northern Ireland life before season 2012-2013 began. I walked into my house and a foul stench hit me right in the face, Anna looked at me in disgust, rolled her eyes and murmured “you’ve done it again”. Yep I had, the familiar stench of an unwashed protein shaker sitting idle in the sink aged 28 days, had made the house smell like moulded cheese. ‘Not a good start’, I thought. I stocked my fridge with all the healthy food I could find and had an early dinner so I could get a good night’s sleep. Well that’s what I’d planned to do. I instead set out to attempt to watch every recorded programme that was sitting on my Sky box that I’d missed since I was away. I’m going to pay for this in the morning. Day One and the smell of Aloe Vera wafted through the cracks in the gym doors. Red faced and raw, one by one we all filtered back into the workplace. There was enthusiasm and anticipation, but most noticeably tension and trepidation in everyone’s faces as the threat of the unknown sunk in. Pre-season is the toughest period of prolonged training we will do all year, it’s a time when we get our fitness levels up so we can cope throughout the long season, so it’s no wonder its most peoples least favourite part of being a professional rugby player. When’s the YO YO test? What’s a skin fold test? Contact sessions in the first week? Really? The rumour mill was in full swing, if it wasn’t for Stevie Ferris’ and Tom Court’s matching purple hand casts to lighten the mood I don’t think I would have made it through the day. There were old faces, new faces, and old new faces ready to begin another campaign. Niall O’Connor and Roger Wilson were back in Ulster colours after sojourns away in Connacht and Northampton and Tommy Bowe was on his way from Wales. Our new Coach Mark (Anscombe) spoke briefly about our goals for the next six weeks, but didn’t give too much away on what it will consist of, keeping us all in the dark. I was already in a dark place. There was no time to chat and catch up as JD and Kevin handed us our gym diaries with a huge grin on their face, they had been waiting for this day for months. We were like a Christmas present that had been sitting under the tree and now it was time for them to open it. The gym diary had the weight of a dictionary, and I began day 1 of a six day weights programme. By the end of the week I’m going to need to hire someone to carry my arms around. One daunting aspect of pre-season is the skin fold test. A test which determines body fat composition by taking scores from seven different parts of the body and has front rowers miraculously absent and calling in sick. Even the most confident of guys walk into the test chest pumped, boasting that they haven’t had a carb since 2009, only for the nutritionist to pinch and pull their skin like they’re kneading dough. If the test itself was borderline embarrassing, displaying everyone’s results on a notice board is downright mean! After the test you fall into the categories of having to decrease your score, stay the same, or in one exceptional case of Chris Cochrane, increase your score. While most guys will be having fruit and yogurt for snacks during training, Chris will be having a happy meal. On the pitch our new coach, Mark, has wasted no time in settling in, taking charge of wrestling and contact sessions in the first couple of weeks, shedding some of the boys ‘holiday’ weight and at the same time focusing on specific rugby fundamentals that will be key to the way we play this season. The full squad is yet to assemble as we wait for the Irish boys to get a couple of more hard earned weeks rest, but it is a crucial time for the rest of the boys to get our fitness and skills up as our first pre-season game is just over 3 weeks away against Bayonne. I’ve unfortunately been part of the Rehab group, which is for boys who have injuries or who are returning from surgery. Our days consist of double gym sessions, physio, and riding bikes like we’re Lance Armstrong. Week by week a player graduates from the rehab group back into full training until hopefully no one remains. So we are three weeks down and three more weeks of training to go before we set off for France for a camp where we’ll play Bayonne as we did this time last year. Everyone at Ulster is determined and excited to continue on the success of last season and hopefully bring some trophies back to Ravenhill. However there is a lot of hard work and training to be done before we can think of that, and that’s what pre-season is for, to set the foundations. Email “Provincial matters: Ulster's Adam D'Arcy with his take on pre-season prep”. 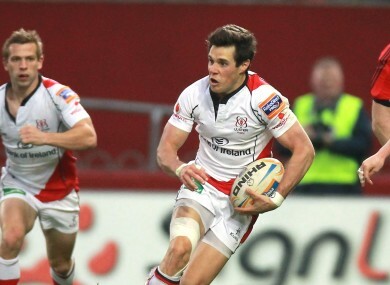 Feedback on “Provincial matters: Ulster's Adam D'Arcy with his take on pre-season prep”.